Airplane, jet, flying machine shape magnets keep your message in front of your clients. Personalized with your services and contact information, full-color magnets are an effective marketing tool that keep selling long after other products have been tossed away and forgotten. Magnets stick to refrigerators, filing cabinets, appliances, vending machines, lockers and any other metal surface and will hold paper, pictures and more. Perfect for airports, airlines, bush pilots, private jet rentals, pilot services, airplane mechanics, airline ground crew important numbers, flight services, flight hotlines, flight attendants, hotels, motels, convention centers near airports, car rentals, limo service, taxi services, service contractors, airline professionals, announcements, etc. Keep your message in front of your clients inside and outside. 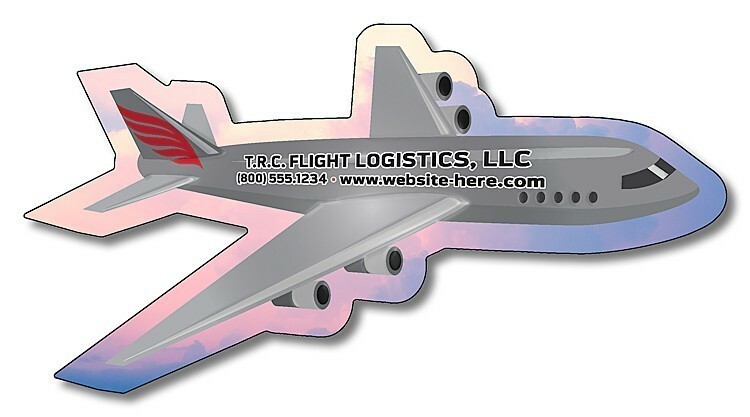 Personalized with your services and contact information, outdoor flying airplane jet shape magnets are an effective marketing tool. Magnets keep selling long after other products have been tossed away and forgotten. TUFF MAG Magnets are 30 mil thickness and will work on cars or any other metal surfaces are perfect for outdoor applications - water repellent, fade resistant and outdoor safe.